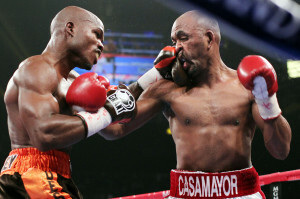 At some point during Timothy Bradley’s tuneup/walkover against Joel Casamayor the other night, a remark was made by HBO announcer Jim Lampley that one of the reasons Bradley had changed promoters was that he found himself fighting in a cavernous, empty arena in what was supposed to be a major fight for him. Well, that isn’t really the whole truth, as we’ll get to in a moment. Of course, he is referring to his fight against Devon Alexander in January, which took place at the Pontiac Silverdome and yes, was sparsely attended. But the point is that the fight landed in that location because his promoter, Don King, was able to sell the live gate to people who had interests in that location. It wouldn’t have had to be sold to that location had Bradley been the type of fighter who could draw fans. But Bradley does not have that kind of cachet. The fight couldn’t be sold to a casino location, and wasn’t going to make it as a live gate attraction. But naturally, these guys want to be paid, because they figure the title, in and of itself, means money. Bradley is a skilled fighter, but he is not necessarily a salable commodity. He doesn’t have any hometown following, and even though he’s gotten his share of television exposure, he doesn’t seem to have captured the imagination of the public. Maybe that’s not all his fault; maybe he hasn’t gotten the big PR push. It’s not that his style is so displeasing. But that’s just the way it is. There are simply certain fighters people don’t care a lot about. And frankly, Bradley is like a hundred other fighters who have come along and been the beneficiary of a fractional title, which, more often that not, is what makes the fighter, rather than the other way around. The bottom line, and what many observers and fighters don’t understand, is that ultimately, this is a business where you have to put asses in seats, whether those seats are in an arena or on a couch in front of a TV set. That’s why fighters who draw viewers get preferred spots on television, and why they get to fight in their hometown if they are a live drawing card. Tim Bradley does not fit either of those criteria right now. Which brings us to where he is now. He signed with Bob Arum for one purpose, and one purpose only – to get the opportunity to fight Manny Pacquiao. Bob Arum signed him for one reason only – not to make him a star, but to have him available to be one of Pacquiao’s opponents at such time as it makes sense. And it could make sense sometime in the next twelve months. He’s not going to get any more of a promotional push than he did before, unless it is in service to one thing: making him important enough to serve as an opponent for Pacquiao. When that happens, I am sure that Arum and his Top Rank crew will do a very good job of creating the impression that he is a major threat, much like they were able to do with Joshua Clottey, who hardly landed a punch in anger when he stepped in with Pacquiao last year at Cowboys Stadium. And considering how Pacquiao looked on Saturday, maybe it wouldn’t be so hard to sell him as someone dangerous. And while the pay-per-view numbers won’t create a blockbuster, on a risk-vs.-reward basis, it will probably work out well enough to satisfy the people who need to be satisfied. So he fits right into the “milking” process, as Arum tries to extend Pacquiao’s pay-per-view run. I guess you could say that in retrospect, turning down $1.3 million to fight Amir Khan was chicken feed was a good business decision, considering the $1 million or so he got to fight Casamayor, a 40-year-old who is three and a half years removed from a meaningful win. I say that in little tongue-in-cheek fashion, because that’s the first clue that Bradley might be the guy in the ring with Pacquiao, if a Juan Manuel Marquez rematch isn’t made. That million was not for the walkover; it was the down payment, for whenever it’s going to happen.